XOXOAD is delighted to welcome Eden Ashe, author of numerous books including EVER MINE, now available from Lyrical Press (a division of Kensington Books). You can read an excerpt from EVER MINE here. We spoke to Eden about her love of fairy tales and fantasy, the importance of dragons, and her nerd credentials. Take it away, Eden! You have a fun tagline on your site: “Rewriting history, one fairy tale at a time.” Why do you choose fairy tales as the basis for your novels? And how do fairy tales connect to history? Is there a tale that you feel already “gets it right” and that you wouldn’t rewrite? I always blame The Lion, The Witch, and The Wardrobe by C.S. Lewis. It was the first book I ever read by myself, I think in second grade, and I’ve been hooked on fairy tales ever since. I love the possibility that magic and fairy tales exist, and that dragons could actually be the good guys fighting for humanity all throughout history. Every culture has their own fairy tales, so what if the stories were real? What if fairies were real? Dragons? What would happen if Thumbelina was kidnapped in modern times and given to a suitor? As for tales that I feel already “gets it right”, I can’t think of any. That’s not to say there’s not, but part of the fun of being a writer obsessed with telling modern day fairy tales is turning the classics on their head. Like Snow White, I’ve always been more curious about The Huntsman than the prince. And Cinderella–REALLY? You’re in love with a man who doesn’t even remember what you look like the next day? It’s fun to wonder how a modern heroine would react to the classic story, and how she’d adapt it for modern times. You are an avowed Defender of Dragons — any dragons in EVER MINE? If not, what made you branch into a dragon-free story? No dragons in Ever Mine, though I’m sure they exist somewhere in that world. I’m not sure I could ever write a story where dragons don’t exist. But while I love them madly–and I do, I really do–it’s all the different worlds of possibilities that intrigue and fascinate me. That, and Katenia has been in my head for awhile. Once I finished the first Dragon Lore book, she sat me down and demanded I focus on her. She’s a brat that way. What are the biggest challenges Katenia faces when she finds herself in the human world? And if the tables are ever turned on us, what should we humans watch out for if we’re kidnapped to faerie land? Oh, wow, the absolute biggest challenge Katen faces is the language barrier between her and Nathan. She doesn’t understand half of the phrases he uses, because she tends to take his words literally. I’m pretty sure she spends the majority of the book telling him she doesn’t understand him. Interestingly, the fairies of Katenia’s world are very bigoted toward the human race. We destroy the planet, we tend to crush everything smaller than us underfoot without even noticing, and we rush from Point A to Point B without noticing nature around us. But from the beginning, Nathan, the first human Katenia comes into contact with, is different than she expected. Though he thinks he’s imagining her, he still goes out of his way to help her. So instead of seeing ugliness and brutality, she sees hope and kindness. So my advice, if you’re ever kidnapped by a fairy, show them kindness and respect their world. Oh, and be prepared to be naked A LOT. Katenia has warned me they don’t like restrictive clothing. Dragon Lore book 2 is in the final rounds of gutting/reworking before being sent to my awesome editor, and I’m diving into another fairy tale. This one loosely based off The Frog Prince and featuring Katenia’s brother, Linx. I also have a race of guardian angels impatiently waiting for their stories to be told. You proudly display your “nerd cred” on your site, thusly: “I am a Browncoat. I am Sherlocked. I am the Bad Wolf. I am Team Free Will.” Got any great new SF/F shows or books you’d like to tip us to? Yeah, I don’t really do so well hiding my inner nerd. Did I mention I have a J.R.R. Tolkien tattoo? And tried to name my youngest child Sky Walker? As for great new SF/F shows or books, right now I’m really enjoying the show Haven. It’s based off a Stephen King story, “The Colorado Kid,” and it’s different. I was obsessed with Lost Girl for awhile but I had to take a break when I found myself wanting to reach through the television and slap Bo. But really, what I wish more people would watch is Community. It makes my geeky little heart ridiculously happy, and they’re always coming up with new ways to be meta and make pop culture references. Just ignore the Gas Leak year. As for books, I am *loving* the Archangel’s Creed series by Azure Boone and Kenra Daniels. They’re different than any fantasy romances I’ve read, but they’re amazing. Also, anything by Emma Weylin if what you’re looking for are two people who want to be together and have to face down entire worlds to get to their happy ending–and want to see Thor make Star Wars references. The classic tale of Narnia that's been a mainstay of childhood bookshelves all over the world. 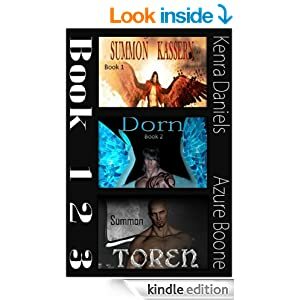 The first three books in the Archangel's Creed series: Summon Kassern, Summon Dorn & Summon Toren. Can the love of a half-faery woman free this druid from an ancient curse? Just got my copy of Ever Mine…cannot wait to read it!